THE UNITED ARAB EMIRATES WIN THE CAKE DESIGNERS WORLD CHAMPIONSHIP FIPGC 2017. Milan, 25 October 2017. Her name is Jade Saducas and with her creation, she has brought the United Arab Emirates to the highest step of the podium of the Cake Designers World Championship, organized by FIPGC, International Federation of Pastry Ice Cream Chocolate, during Host in Milan, the International Exhibition of Professional Hospitality. With a spectacular creation of sugar paste and sponge cake, in which a Spanish sailing ship and a traditional grinder twirl around a rudder, she recounted the journey into the world of coffee and cocoa. In second place was the US artist, Bryson Perkins, who has created a spectacular composition representing a sort of Caribbean volcanic island, with lots of flora and fauna perfectly reproduced in sugar paste. From the cone of the volcano “erupts” an allegorical representation of the feminine of the triumph of the chocolate. Poland is the third absolute place: Jowita Woszczynska has made a composition that evokes a fantastic garden, populated by elves and fairies, representing a sort of dreamlike chocolate and coffee paradise. The three winners have unexpectedly beaten some of the most famous teams in the world, such as France and Italy, which have a very strong tradition in the handling chocolate and sugar. 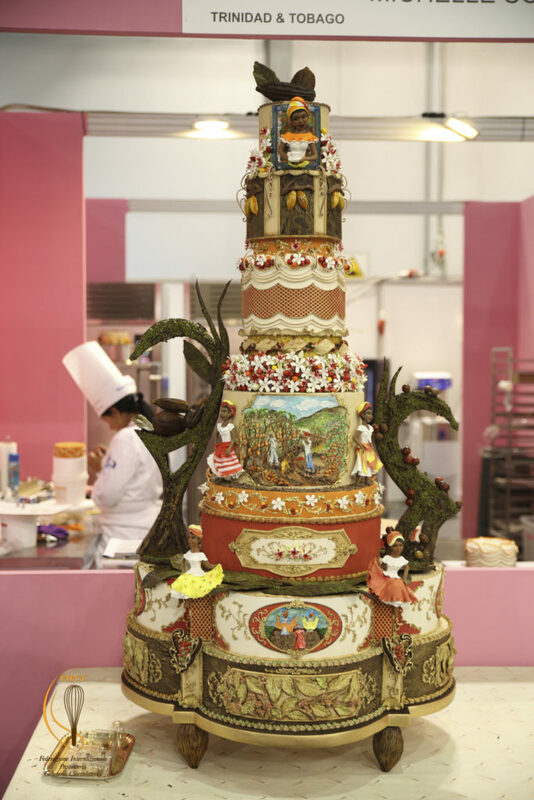 Special award to Italy, holder of the title, which wins the title of Best Exhibition Cake, and for Trinidad and Tobago, which wins the title for Best Taste Cake, while Sri Lanka wins the Critics Award, by Pastry Magazine. 20 teams competing, coming from all 4 continents, from Morocco to Sri Lanka, from the USA to China, from Peru to Trinidad and Tobago, up to the great European “series heads” such as France and Italy. Judging the works a jury of international experts, under the chairmanship of Kristina Rado. The cake designers, have passed three tests: the first, the Exhibition Cake, a concept developed previously and presented exclusively for the World Championship, whose theme was to “Discovering the World of Chocolate and Caffè “, the second was the Tasting Cake, where the artistic side had to balance with the taste, and finally, the highlight: the reproduction, on a smaller scale, of the show cake.